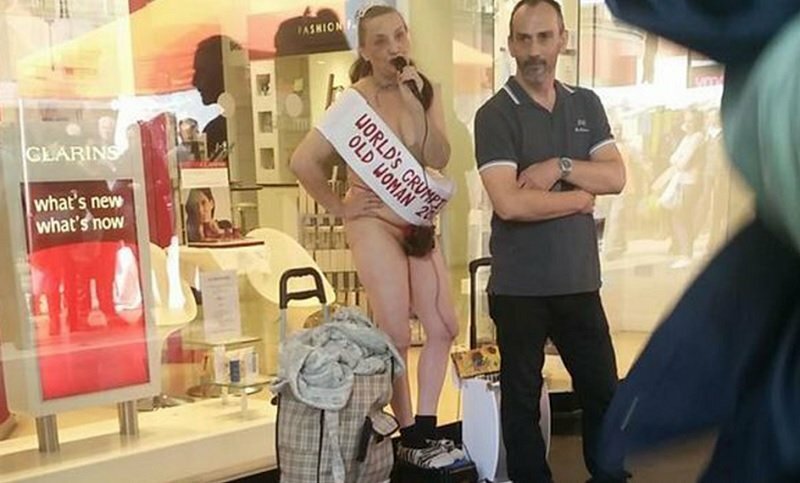 A 56-year-old woman staged a strange protest in Croydon, London, when she glued herself to a department store window while wearing just a bra and a pubic wig. Wearing a sash that read “WORLD’S GRUMPIEST OLD WOMAN 2015“, Kay Bishop stayed for several hours and spoke over a microphone to shoppers. She told photographers that she was staging the protest because she was grumpy and wanted to make a point, saying she was “fed up with everything.” However, she later explained that she was specifically trying to draw attention to the plight of Syrian refugees and wanted to encourage governments in Europe and North America to do more to take in those seeking asylum.